It’s Autumn – full blown Autumn – when jumper/sweater wearers rejoice and get to crack out all of their meticulously collected knitwear to make the most of these chillier days. But what about those pieces that are looking a little worse for wear? Replacing a few worn out items for a few bolder pieces has never been easier! Affordable knitwear is all around us, I’ve rounded up a few beauts for your ease and hope you find some inspiration for your own wardrobe! 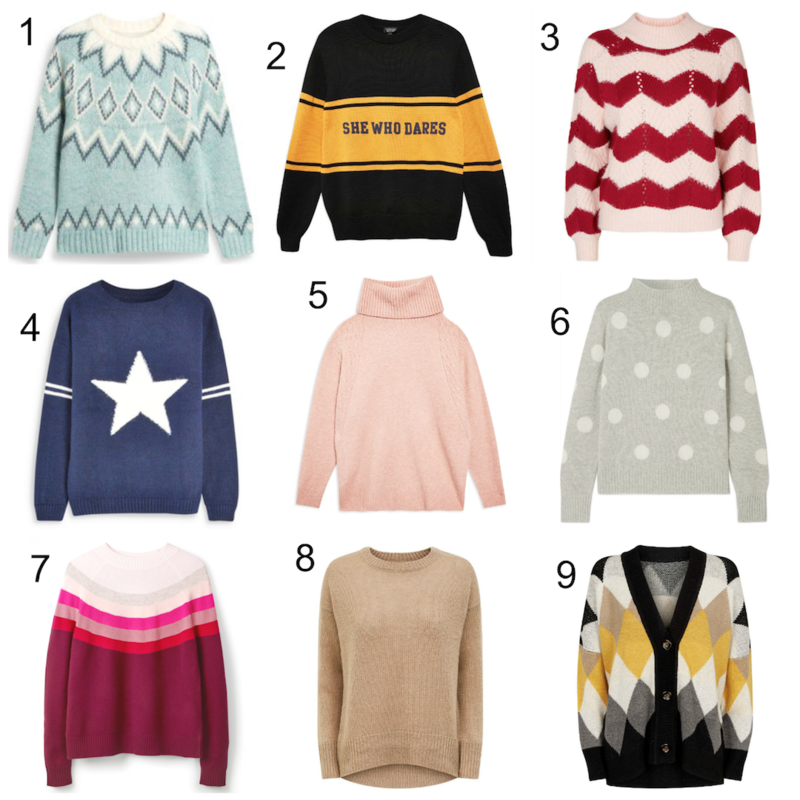 I love them all, but if I had to pick just one for my wardrobe, I think I’d be going for a very different look to my usual Autumnal uniform and opt for number 2! Worn with blue jeans and white plimsoles, I think I’d be onto a winner! Previous Post Have You Been To Token? Me too Ama – it’s got such a cool vibe to it! I’ll choose 2! Looks edgy but still cute lol. number 8!! i am looking for cream/beige colors this autumn for real! I always say this but I am never able to stick to it. Lovely choice Caterina – stay strong and find some gorgeous cream/beige jumpers, there are loads out there!! Love the second one, sporty and cosy! Thanks Anika – it seems to be high on everyone’s list!! Thanks Melody I’m delighted you like them!! 1 and 9 are my favourite! Thanks Vanessa – I want them all!! I hear you Cristina, it’s a gorgeous one – perfect for Autumn/Winter!! Great choice – a real staple piece! !